Hope you found us a day early this week. In order to enjoy our special time with family and friends, I'm just starting a little early. And speaking of Thanksgiving, I want to say "Thank You" to all of you who come over here each week to join in on the vintage fun. Thanks so much for sharing your homes, dreams, and ideas with all of us. So here are a few links from last week that bring out the best of "vintage". Mary from Home is Where the Boat Is had a little "window of opportunity" to do some decorating at her Potting Shed. 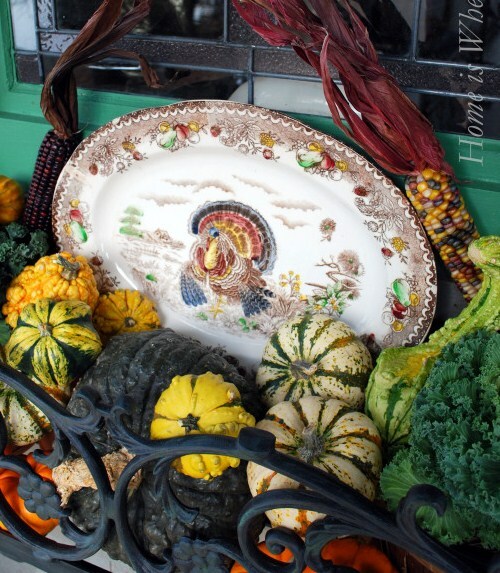 Using vintage turkey platters and plates, she dressed up her amazing little shed for the Thanksgiving holiday. Carolyn from Aiken House and Garden has been planning for a more simple approach to Christmas, and is using lot's of pops of traditional red. Carolyn's home and blog posts look like they came straight from a magazine. Thank you, Carolyn for sharing the romance of your lovely home and gardens with all of us. Patti from Ivy and Elephants shared a gorgeous crystal cruet set, I can just see this for an elegant Christmas tablesetting. Lot's of crystal and silver are a magical way to decorate for the Holidays. 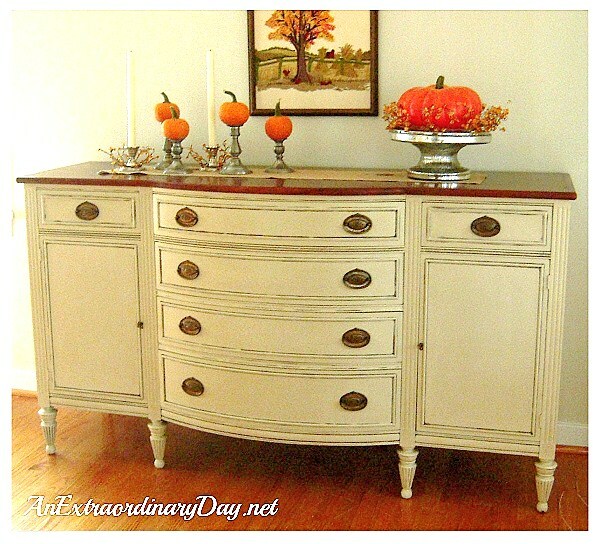 Diane from An Extraordinary Day gave us the pros and cons, ins and outs, of transforming a gifted sideboard. Gosh, I'm a sucker for a white sideboard!!! And this one turned out amazing! Pocket Mirrors with a vintage touch from Erika at Boulevard de L'antique. Wouldn't these be a wonderful Christmas Gift or Stocking Stuffer? Love those images! And Penny from Penny's Vintage Home, decorated her wonderful white piano with a menagerie of Christmas delight. A winter wonderland of Santas, deer, and other woodland creatures playing in a glittered forest of candlelight. 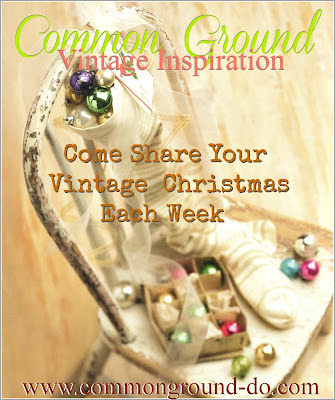 Hope you'll join in with all your vintage and vintage inspired posts. Please have a link back to Common Ground within your post to be featured. And yes, it's finally time to unpack all those vintage treasures and ornaments, so come share all your Christmas bits and baubles over here, from now till New Years! Check out these other great Friday parties for some weekend fun! full of gratitude for what's so important in our lives! Don't you just love everything Carolyn puts together? Thanks so much for hosting and have a very Happy Thanksgiving! I did not get a post put together for this week, but just wanted to wish you and your family a Happy Thanksgiving! 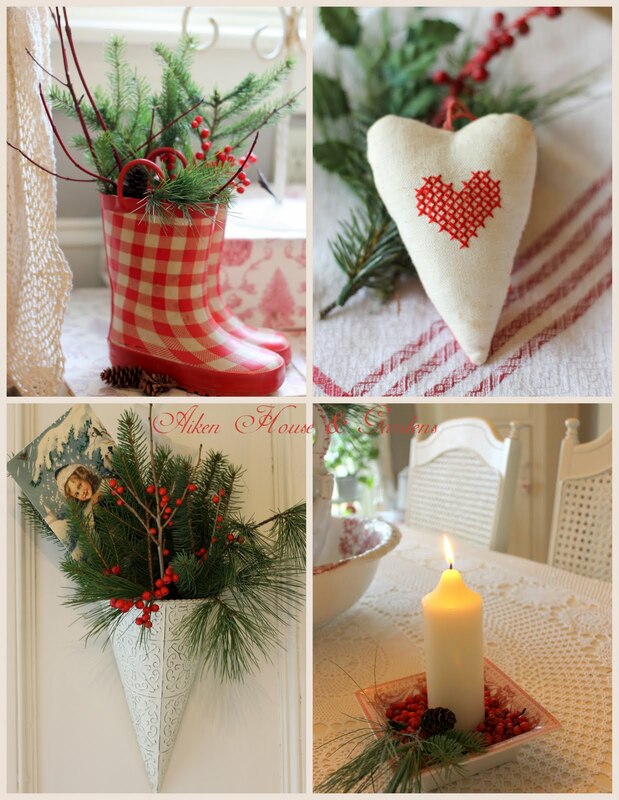 Debra~ I'm thankful my little potting shed was featured this week! Wishing you and your family a joyous Thanksgiving! Thanks for the early party, Debra. Enjoy your Thanksgiving. Love the features. Beautiful features, Debra! Thanks for hosting and Happy Thanksgiving! I am glad I checked my sidebar and saw the party! My wings just joined the fun. Thanks and Happy, Happy Thanksgiving to you and your family. Thanks for hosting, and Happy Thanksgiving to you and yours! Those are some very pretty features this week, Debra. Thank you so much for hosting the party today, and I hope you and your family have a wonderful Thanksgiving! 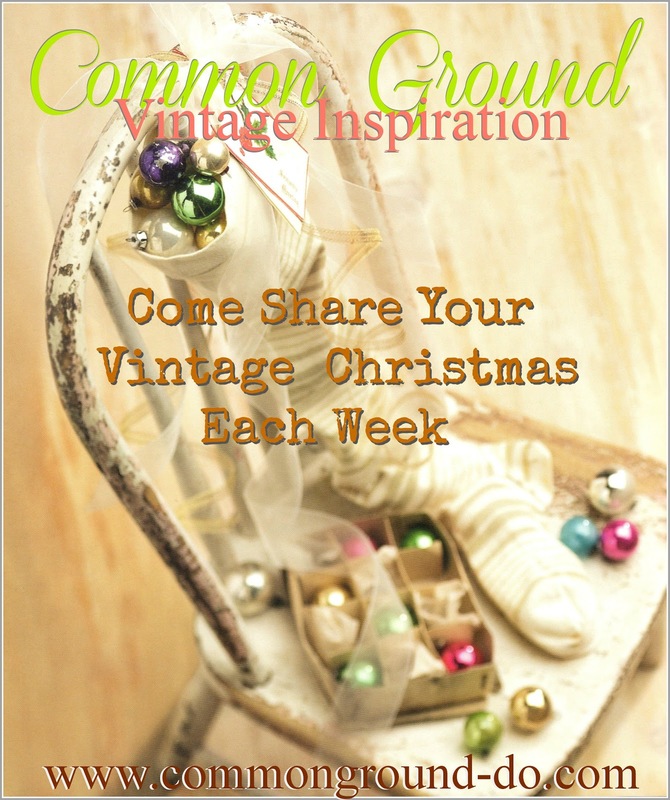 Your featured bloggers are all inspiring for the vintage Christmas decor! I am so~o~o smitten with Penny's white paino vignette!!! Thanks for hosting this weekly meme where inspiration always abounds! Thank you for hosting, and have a wonderful Thanksgiving! What beautiful features you have chosen, Debra! It's nice to get a peek at Christmas, but, I am, especially, grateful for the Thanksgiving features. Blessings and Happy Thanksgiving, my friend. Thank you so much for hosting this nice party. Oh by the way the link for the others Friday parties don't work. Happy Thanksgiving to you Debra and your readers. Happy Thanksgiving! I hope you have a wonderful day with family. Thanks for hosting! Have a Happy Thanksgiving! Debra, you're probably not checking email this morning, but when you do----have a great Thanksgiving weekend! Love your blog, but you need to delete the apostrophe in the word "lot's" that is sprinkled throughout your blog. Wishing you a very wonderful Thanksgiving Debra! Love all of the features. That red and white collage was magical. Thanks for letting us share. Hugs to you and many blessings this day! Happy Thanksgiving Debra!! Thank you for joining me at Home Sweet Home and for hosting this fantastic party! Dear Debra, thank you very much for featuring my pocket mirrors, I am very happy, thank you for hosting this great party. Yipee, I had something this week to share with your party. Hope you had a lovely Thanksgiving. Thanks for hosting Debra. What wonderful feature photos. Thanks for hosting. Thanks so much for hosting this fabulous Party. So happy to join in. You have one too! I love the design on it, I still see them in front yards and maybe some day I'll see another one for sale. I wouldn't mind having a pair. Thank you for hosting! Thank you so much for the feature and the kind words! Fantastic Features!! Thanks so much for hosting! !